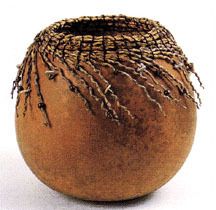 A simple overhand stitch was used to attach the date palm to this gourd, but the effect is stunning. 1. Cut an opening in the gourd; it can be regular or very curved, depending on the shape of the gourd and your own design preference. Remove the pulp and seeds and sand smooth the interior and the cut edge. 2. With a drill or leather awl, makes holes around the opening just large enough to accommodate the needle and lacing material. Drill the holes approximately 1/2 inch (1.3 cm) apart. 3. Treat and finish the gourd shell with several coats of neutral-colored shoe polish. 4. Soak the date palm in water for about 15 minutes so that it will more easily conform to the curvature of the opening. With one hand, hold some of the date palm against the top edge of the gourd neck. Starting inside the gourd, insert the threaded needle through a hole and pull the thread around and over the date palm (see photo 1). Proceed to the next hole and pull each stitch taut. Use an overhand stitch: loop the thread over the coil and insert the needle through the next hole in the gourd shell. (If you pinch the thread firmly in place as you bring it over the coil, you can create a vertical pattern as you add more coils). 5. To create a fringe of date palm, add a new piece with each stitch. If the coil gets too thick, cut away some of the thick ends of the previous pieces (see photo 2). 6. If you want to cover only the edge of the gourd with a single layer of date palm, taper the ends of the coil so they can be tucked behind the beginning of the row to create an even surface. Knot the lacing thread when the ends of the date palm are secured and bury the thread in the coil. Use masking tape to hold the fringe ends of the date palm secure against the gourd and out of the way of the coiling (see photo 3). 7. If you want to build up more layers as was done here, keep adding rows of coil on top of the first row. When you begin the second row, put the needle through the center of the first coiled row, next to the stitch, instead of through a hole in the gourd (see photo 4). 8. Some ends of the date palm are thick and stiff. Cut them off when necessary to maintain a flexible coil (see photo 5). 9. Add new pieces of date palm to keep the coil a consistent diameter (see photo 6). 10. When you have added as many rows as you want, cut the ends of the date palm to a gentle taper so that the final row creates a smooth edge (see photo 7). 11. Work the final ends of date palm behind the last row of coiling and secure the lacing thread with a knot, burying the end in the coil (see photo 8). 12. To finish, thread the small heads onto the date palm fringe. More examples of coiled gourd baskets. There are many excellent books available that provide further instruction on coiling materials, techniques, and variations that can be adapted for embellishing gourds. We particularly like Fiber Basketry: Homegrown and Handmade (Kangaroo Press, 1989) because of its emphasis on using garden materials for coiled basketry.